Ellie Davis as the Wiched Witch Evileena. IT IS now less than a fortnight until the opening night of this year’s Renmore Panto, Beauty and The Beast, and tickets are flying out of the Town Hall box office like hot mince pies. Scripted as ever by ebullient Panto Dame Peter Kennedy, and directed by the surefooted pairing of Brian and Seán Power, this 39th Renmore Panto is all set to serve up yet another seasonal feast of madcap and melodic merriment and mayhem. The villainess in this year’s rollercoaster tale is Wicked Witch Evileena, played by Renmore – and Galway - newcomer Ellie Davis, who has just recently arrived on these shores from New Hampshire. Ellie grew up in 'The Granite State', performing theatre and circus arts with various companies such as the Flying Gravity Circus, the Raylynmor Opera Company, and in school at Smith College. 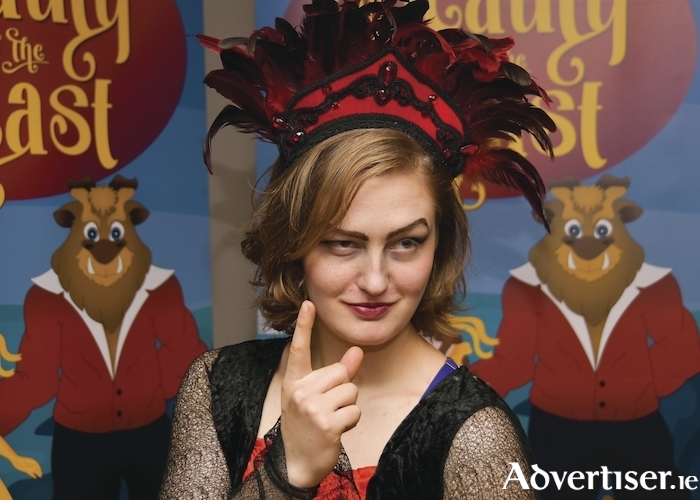 She currently teaches at the Galway Community Circus, and has just performed in the Macnas Halloween parade. Ellie has heard of this strange phenomenon of the Irish Christmas pantomime, but this is her first time performing in one. Ellie goes on to tell me how she came to Galway; “I studied in Glasgow and I really loved it and I play Irish and Scottish fiddle and I knew I wanted to come back to this part of the world at some point, though I didn’t quite know when or where or how. After I graduated from college I kept hearing about Galway; some friend would ask had I ever been here and then tell me it would be a great place for me. Ellie thus barely had her bags unpacked before she found herself cast in Renmore Panto’s Beauty and The Beast in the featured role of Wicked Witch Evileena. How has she been finding her intro to the world of panto so far in rehearsals? “It’s really fun,” she enthuses. “The first time I ever saw a panto was last winter when I was visiting a friend in Wexford who was in one, and I saw their dress rehearsal and saw straightaway how it is very different from your traditional play where the audience only clap at the end and are quiet up until then. Beauty and The Beast runs at the Town Hall Theatre for 19 performances from December 30 to January 14. Shows at 7.30pm are on December 30 and January 1, 2,4, 5, 6, and 10 to 13; 2.30pm matinees are on December 30 and 31, and January 1, 6, and 13; 12 noon and 4.30pm performances on January 7 and 14. There will be a sensory friendly performance on January 7 at 12 noon. Tickets are €17/15 via the Town Hall Theatre (091-569777 or www.tht.ie ).